Tactical Air Control Party Staff Sgt. 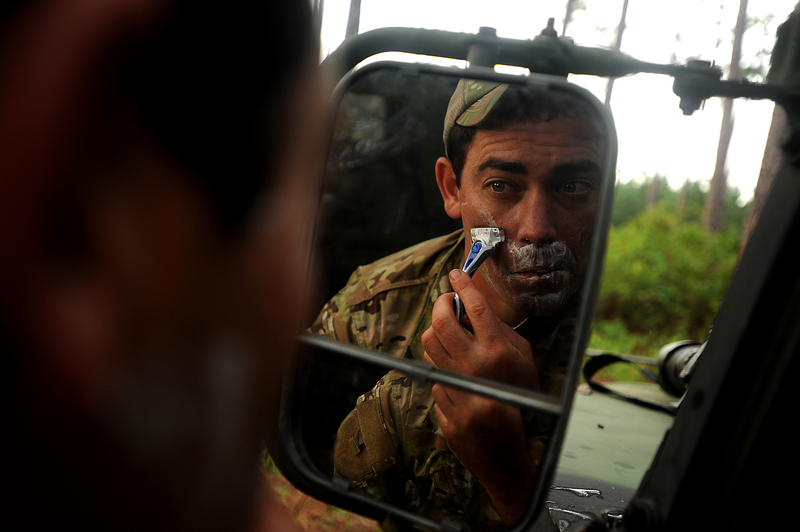 Nathan Angel with the 147th Air Support Operations Squadron, Houston, Texas, gets a quick shave in before heading out on patrol performing land navigation to his teams targets on Aug 16, 2011, at Townsend Range during a three-day field exercise in Brunswick, Ga.
A lot of people may not understand that special operators such as SEALs, Delta Force and controllers don’t grow their hair out and wear long shaggy beards because it’s cool or because they don’t care about being military. It’s because in the broad scheme of their mission, personal grooming sometimes has to take a back seat. And there is an element of blending with the local populace who they are often training or working with. This TAC-P is taking the time, though, and I think that’s worth noting. The photographer, by the way, is one of the highest regarded photographers in the military today. Master Sgt. Jeremy Lock is the perennial favorite to win the Military Photographer of the Year award handed out annually at Fort Mead at the Defense Information school. Lock won this year on the back of a strong effort called Keri’s War, which you can see here. The photo series documents an airman’s torturous struggle with breast cancer and chemotherapy.